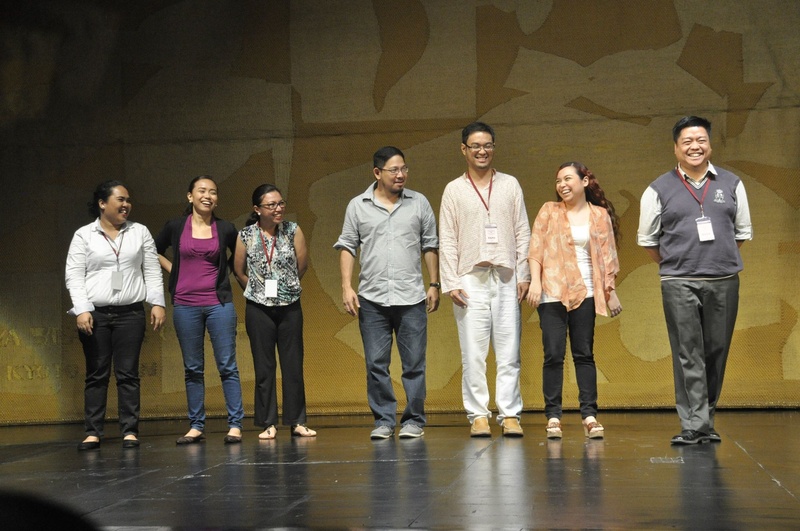 Last October, I was fortunate to be part of the team of trainors for the CCP Hands-on Choral Workshop. This annual workshop is held on the last week of October, done in partnership with the Philippine Madrigal Singers. Giddy people early in the morning: some present and alumni members of the Philippine Madrigal Singers aka trainors. Marivic Llamas, Krystl Buesa, yours truly, Joel Aquino, Paolo Pardo, Bianca Lopez, Mark Carpio. 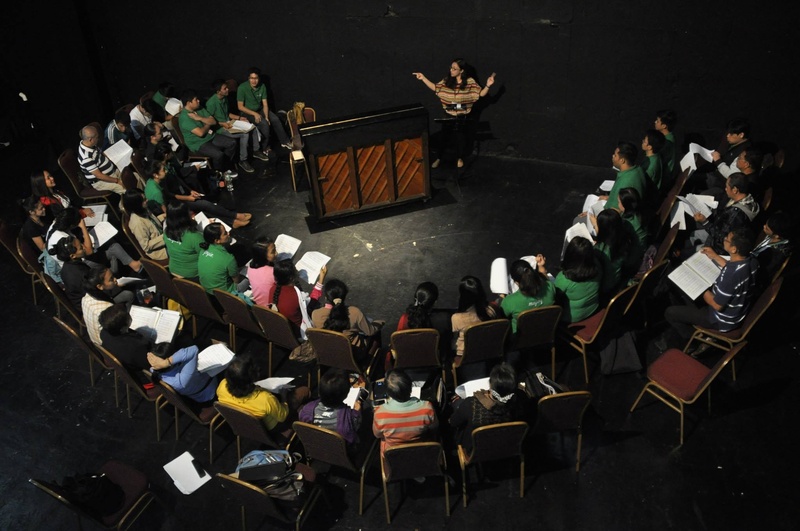 The workshop is now on its 12th season, and has attracted choral groups and conductors from all over the Philippines as well as other countries. This year, we had a choir from Kuala Lumpur participating in the workshop. Mark Carpio conducting all participants of the choral workshop. They filled the entire Tanghalang Nicanor Abelardo stage! This was not the first time for me to join as trainor, but everything seemed new to me this time around. 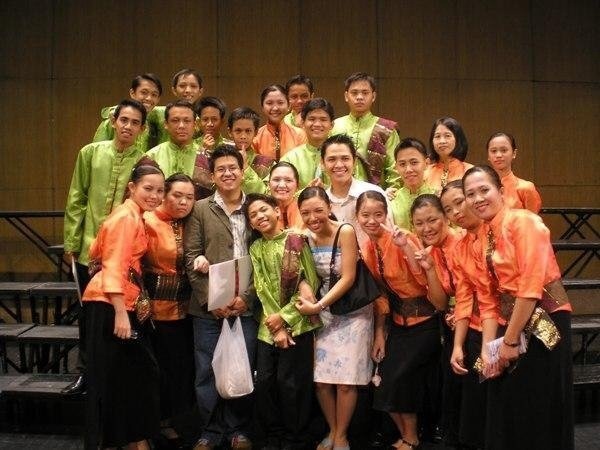 With the God’s Heritage Chorale from Bulacan, the choir I handled back in 2006. Along with Sheen Sanchez, another Madz alumnus. Photo credit: Churchill Garcia-Natoc. This choir joined the workshop again this year, with some familiar faces and new ones who got to experience the Madz training through the workshop. I guess they find something good and new in each workshop that they’ve participated three times already! 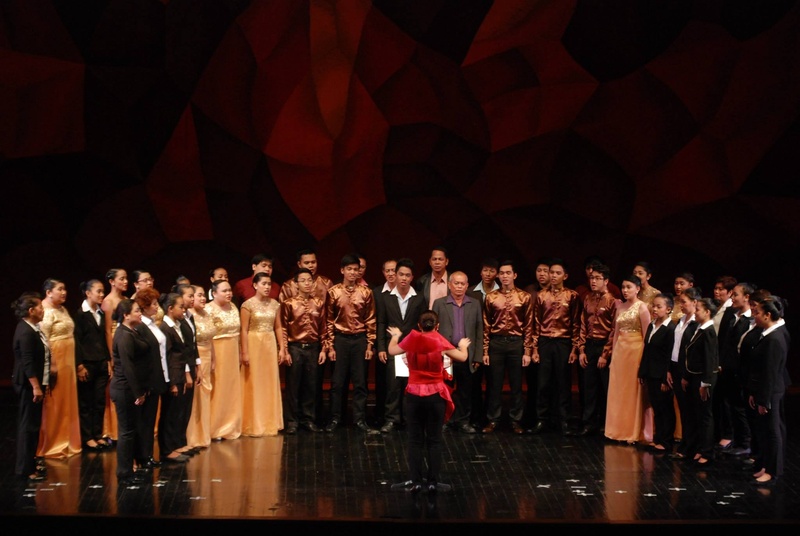 Early this year, the Cultural Center of the Philippines called itself as a Center for Choral Performance, where major choral events are lined up in the Center until next year, the highlight being the second Andrea O. Veneracion International Choral Festival in July 2015. This year’s choral workshop was made even special because of several factors. Aside from the fact that it had been in hiatus for two years (there were no choral workshops held in 2012 and 2013 because of Madz trips abroad–incidentally, the years I worked for the Center), the workshop also featured a special Artist Talk by no less than Mr. Ryan Cayabyab, who created a new arrangement of one of his songs, premiered by the participating choral groups. In Mr. C’s talk, he took the audience back to the days when fate had prepared the road for his musical journey, as a son of an opera singer who did not encourage him to take the same career his mother took, as a young UPIS student who was just tinkering on the piano, and as a teenager who would try out different careers–from winning a painting contest to applying as a disc jockey, and eventually getting the biggest gig that paved the way for his musical career. His story was unbelievable, humble, yet very inspiring. Post by Philippine Madrigal Singers. Choirs from various schools, communities, parishes, and companies joined the workshop. Individual conductors, or choirless conductors as they called themselves, who want to be better conductors learned through the sessions with Madz Choirmaster himself, Mark Carpio. 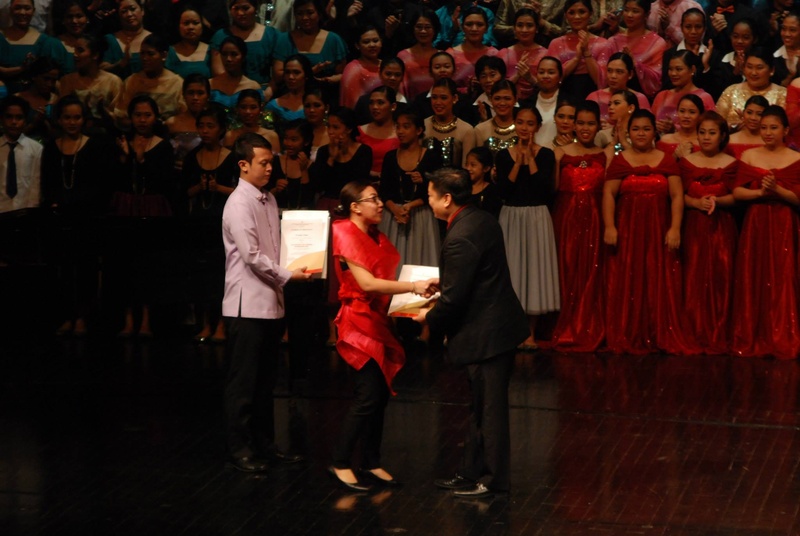 The choirs assigned to me were the MBPS Chorale of Manulife and Musica Chorus of Quiapo Church. The trainors were assigned two choirs each, who each sang a song of their preference, and one song which came from the trainor and will be performed together. I chose What the World needs now is love, a really simple danceable arrangement of the Bacharach song with piano. As they’ve easily learned the piece, I also gave short pieces as some sort of exercise for them. I was surprised to know that trainors will also conduct, as I cannot remember doing that during the previous workshop I was part of. I even confirmed this to Sir Mark, to my surprise and excitement. It was my first time to conduct on the CCP’s Tanghalang Nicanor Abelardo stage! What. An. Experience. To conduct at the CCP Main Theater! With Musica Chorus and MBPS Chorale. MBPS’ conductor, Ms. Oquias, assisted on piano. Ninong Mark handing over the certificate to me. It’s as if I’ve graduated all over again! Thank you, thank you. The choral groups may have different backgrounds and reasons for participating, some of them have mentioned this during the opening ceremonies. But to me, they are definitely champions by just being a good solid group, thirsting for knowledge that will help improve themselves and their choirs as they sing for God and for their schools, churches, companies, and communities. They’ve worked hard for those five days, which seemed really short, but all did and went well. For us, trainors, nothing is more gratifying than seeing the choirs take what you’ve taught them to heart. We’ve witnessed this during the culminating activity. And as we look back at the first day we met them, a lot of good had happened. We’re successful enough to shared a piece of the Madz way. And we hope we could share this to more choristers in the generations to come. Huge thanks to the Madz family for the opportunity to work with these great choristers and for what seemed to be a reunion of sorts among us alumni especially during break times. Likewise to my former workmates at the CCP and the Artist Training Division for being a venue for these choirs to create more wonderful choral music. *All photos, save for one, are from the CCP, as posted in their Artist Training Division Facebook Page. Follow them on Facebook and be updated with their upcoming projects.